4. 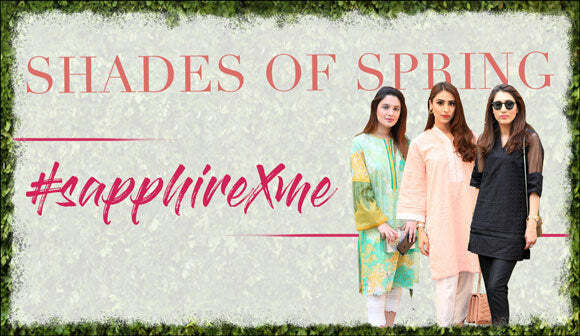 Sapphire provides Free shipping Across Pakistan. 7. Actual delivery time is: Local 1-5 working days and for international its 3-7 working days. 8. Our delivery agents make two attempts to deliver a parcel. We facilitate all our clients to exchange their purchased articles, provided they have made the purchase in Pakistan, online or at any of our store. 1. Any Article purchased can be exchanged within 30 days of purchase from store or receipt by courier. 2. If the article is not used, all tags are intact, packing is in its original condition and you have original invoice with you, then you are good to go ahead with the exchange. Articles purchased on discount are not qualified for exchange though. 3. We don’t offer cash refund instead you will be issued a coupon of same value, which you can use to buy now or in future. 4. Jewelry, Formal outfits, Loose fabric cannot be exchanged. 5. In case of home article return, it should be in Sapphire’s original home packing. 6. As another option, you can contact our customer service department by emailing us at customercare@sapphireonline.pk or you can call us at +92 (042) 111-738-245. Provide all the required information to our friendly representative and if all the conditions met we will schedule the pick-up from your doorstep. Product is already added in wishlist.